What is 5 a day? Include at least five portions of fruits and vegetables in your daily diet. Whether they are fresh, frozen, chilled, canned, 100% juice, and dried fruit and vegetables they all count. For example, one portion of vegetables is, 3 tablespoonfuls of carrots or peas or sweet corn, or one cereal bowl of salad (mixed). One portion of fruit is, for example, half a large grapefruit, or a slice of melon, or 2 tangerines. One portion of dried fruit is, for example, 3 dried apricots, or 1 tablespoon of raisins or currants. Variety is always the spice of life so to get the maximum benefits you need to eat different types of fruit and vegetables. Fruits and vegetables all contain different combinations of fibre, vitamins, minerals and other nutrients. So aim to include a variety of fruit and vegetables in your daily diet to get the most benefit. Remember fruit and vegetables are naturally not only high in fibre, vitamins and minerals (antioxidants) but the result in including them in daily diet means you not only look good on the outside but you can rest assured you'll be good on the inside too. These are all important for your health not only now, but for the future too. Fruit and vegetables have an array of compounds and complex components (phytochemicals) and include flavonoids, glucosinilates and phyto-oestrogens. Some of the vitamins and phytochemicals are also antioxidants, destroying free radicals in the body - these free radicals are known to have a role in causing cancer as well as other harmful effects. The two main killers in the United Kingdom today are heart disease and some cancers. 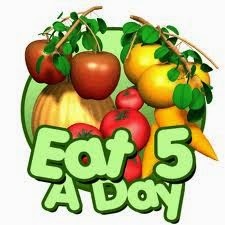 You can help yourself combat these diseases by maintaining a healthy diet including 5 a day. Include fruit and vegetables in your diet as they are packed with vitamins and minerals. They're an excellent source of fibre and antioxidants. They taste delicious (just look at all the juice bars that are springing up) and can help you maintain a healthy weight. There are other probable benefits too, including the delay of the development of cataracts, reduction of the symptoms of asthma, improved bowel function, and help with the control diabetes. Women of childbearing age and those wishing to conceive are recommended to increase their intake of folate and folic acid which can obtained by regular intake of green leafy vegetables and oranges. Children under the age of five can be given a mixed and varied diet of fruit and vegetables but adjust the portion size and maybe water down fresh fruit juices. Overall the direct health benefits of eating plenty of fruit and vegetables can help to boast fibre intake, reducing fat intake, helping to maintain a healthy weight but be aware when juicing fruit as the amount of natural sugars extracted increases the risk of tooth decay.